Disclosure: This post is sponsored by Society Culinaria on behalf of Cacique. All opinions and the recipe are my own. Thank you for supporting the brands we love. And, escape is exactly what I did. 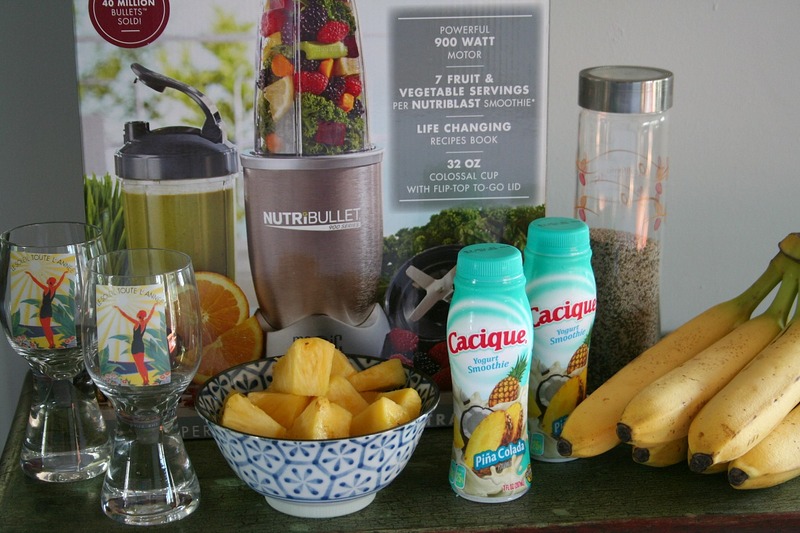 He inspired me to make a Piña Colada yogurt smoothie enhanced with a banana and chia seeds. 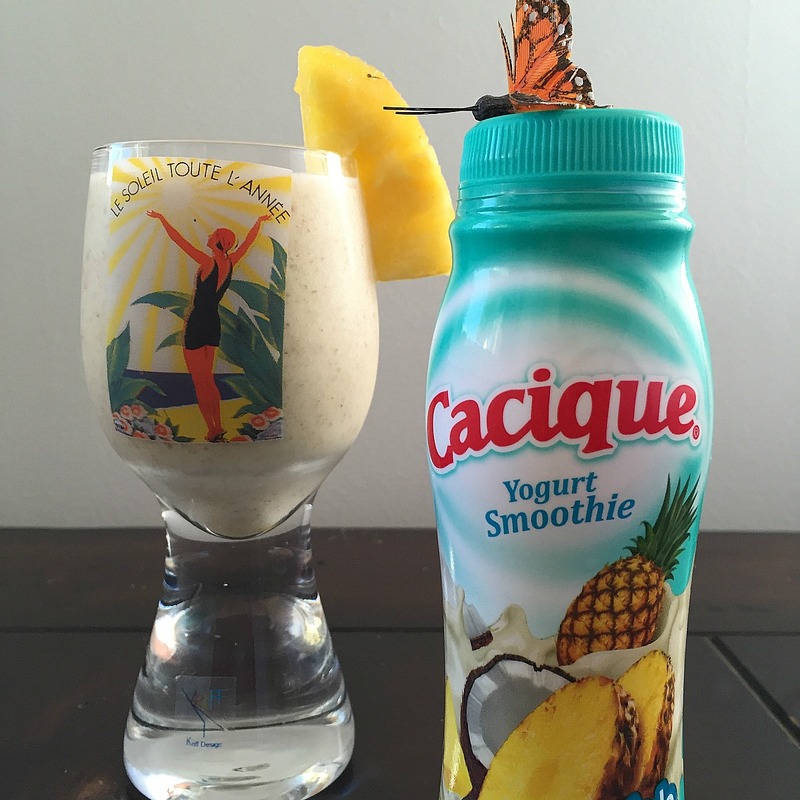 Like a large part of the country, in Los Angeles during the month of August, the temperatures soar into the 80s by 9 a.m. There’s nothing more refreshing than enjoying a cold yogurt smoothie, especially ones made with Cacique’s yogurt smoothie in Piña Colada flavor. The yogurt smoothie is like being on the sand dunes in a tropical resort. Cacique’s yogurt smoothie is rich in protein, a great source of calcium and probiotics (25% of Daily Value), and low in calories and cholesterol. For those of you watching your gluten, all Cacique’s yogurts are gluten free with the exception of the three with cereal: Strawberry Banana w/cereal, Prune w/cereal, and Pecan w/cereal. 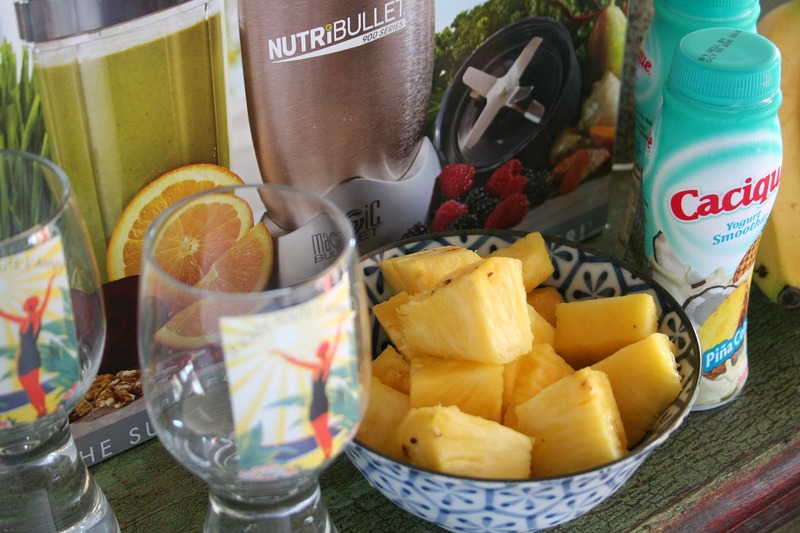 The added banana and chia seeds added texture to the drink. We love adding the superfood chia seeds to our smoothies as the health benefits are plentiful. 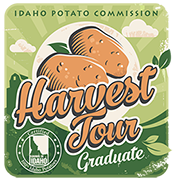 Originally grown in Mexico, the seeds were highly valued for their medicinal properties and nutritional value. In fact, they were even used as currency. Aztec warriors ate chia seeds to give them high energy and endurance. They said just 1 spoonful of chia could sustain them for 24 hours. Chia means “strength” in the Mayan language, and they were known as “runner’s food” because runners and warriors would use them as fuel while running long distances or during battle. What better way to fuel your body than with a delicious, sweet, and creamy yogurt smoothie packed with antioxidant chia seeds. Place all the ingredient in a Nutribullet or blender and blend until smooth.